Here in Houston, purple potatoes comes in small round shapes, parang sinlaki ng daranghita. 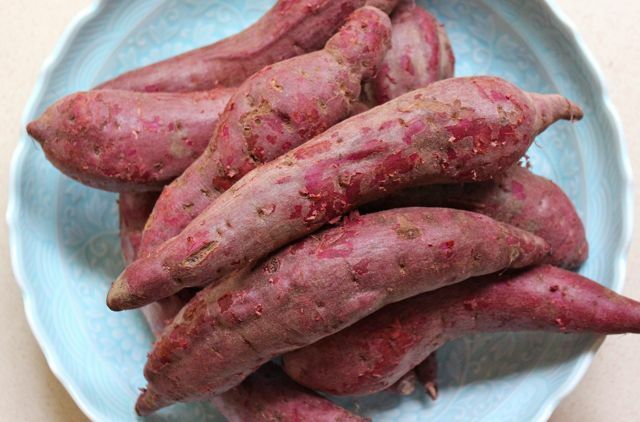 Known in Hawaii as Okinawan sweet potato and can be found in some markets in Japan. I buy them when they’re around and right now is the season. It is becoming more available in the US mainland as farmers find there’s a demand from Asian populations and is a better crop than tobacco. Also being touted to replace artificial food coloring for some colors. When I was younger in Australia, sweet potato was either purple or white, like in the picture in your post on 13 Feb last year. The orange kamote, also unimaginatively called sweet potato, only appeared in markets later, but is the most common now. They must be very easy to grow – I’ve seen them dumped for horse feed sometimes because it’s not worth sending them to market. Yams, for some reason, are practically unknown in Australia. Rich in antioxidants like blueberries, I have resorted to eating purple sweet potatoes when fresh blueberries are no longer in season and my frozen blueberries are slowly dwindling. I have also used it together with frozen ube when I make jaleya…. But sadly, I cannot get them to bear fruit for most likely it needs a long hot growing season….not suited for our climate. Neverheless, I get to enjoy the shoots to my heart’s content…cannot get enough of sautéed kamote shoots with my XO sauce. Together with parsnips, carrots, yellow beets, I cube them, drizzle with olive oil, roast them…makes a visually appealing roasted root vegetable salad with warm bacon/shallot dressing. You could have a go with Chef Larry’s very simple Ukoy. betty q, a friend in Idaho plants the purple potatoes in a big pot and brings it inside her house for the duration of the winter season. She does it with pineapple too and other asian veggies like sitaw. Her house has turned into a mini forest so she’s going to have a green house built. In Perú, there’s a purple potato called papa púrpura (botanical name: solanum andigenum). 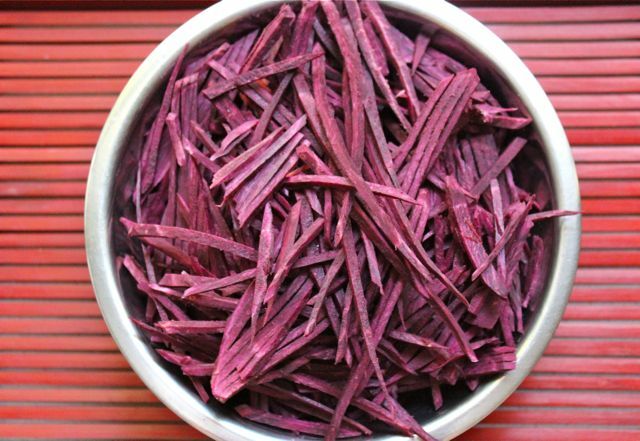 It’s not a sweet potato, just a regular waxy potato with an immensely deep purple color and is higher in antioxidants than other potato varieties. In the past they were reserved for the Incan nobility. Thanks Bijin but I am very careful bringing outdoor plants indoor unless I squirt them first with something like a drop of dish washing detergent in water. When they have had a good bath in it, then I feel comfortable bringing them indoors. I bought some kilos of purple sweet potato on the road side. It was very good! How come I don’t see them in the market? Remembered my sister painstakingly making ube halaya and not allowing us to taste the unfinished dessert. It was only when I tasted it that she realized the “ube” was actually purple camote. Fortunately the camote halaya was still delicious..
potatoes (have no oven), the water turns a bright medium green. What’s that? ?